Blake Crouch is best known for the Wayward Pines trilogy, which has sold more than a million copies and was adapted into a prime-time event series on FOX. He lives in Colorado. "Propulsive...Dark Matter has plenty of heady concepts and phantasmagorical plotting. But it is also beguilingly rooted in [its hero's] desperate travails, elevating this page-turning adventure into an entirely different dimension." “Draws on questions and anxieties we all wrestle with in the dark hours...Crouch has invested [sci-fi motifs] with scientific plausibility, and more unusually, with emotional depth." "Enormously compelling...the fastest, strangest thriller you'll read this year." "Might be the most helter-skelter, race-to-the-finish-line thriller you’ll read all year, with a clever, mind-boggling final twist." "A pacy, action-driven SF thriller...terse prose, strong characterisation and clever twists make for a quick, smart, engrossing read." "A high-tension thriller...always engaging and frequently moving. A strong piece of summertime get-away reading, perfect for those times when the mind wanders to contemplate an alternate reality of endless vacation." "A masterful, truly original work of suspense. Crouch delivers laser-focused prose, a plot that melds science fiction and thriller to brilliant effect, and a touching, twisted love story that plays out in ways you'll never see coming. It all adds up to one hell of a ride." "Wow. 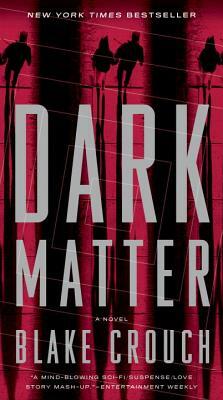 I gulped down Dark Matter in one sitting and put it down awed and amazed by the ride. It's fast, smart, addictive-- and the most creative, head-spinning novel I've read in ages. A truly remarkable thriller." —Justin Cronin, New York Times bestselling author of the Passage Trilogy. “The kind of book the word "thriller" was coined for -- a shooting star through multiple genres, posing fundamental questions about identity and reality before revealing itself as, at its core, a love story. Smart, fast, powerful, and ultimately touching." "An addictive read! When the quantum mechanics kick in (no kidding! ), hold onto your horses -- you're in for an intelligent, breath-taking ride."